This site discusses many great (or at least decent) methods of protecting content. Whether it’s cloaking to prevent RSS scraping, watermarking images or simply including copyright notices, we’ve covered a wide range of methods to keep the bad guys from getting the content while letting everyone else in. If you would like more information, visit the prevention category. However, what isn’t talked about so much are techniques that you definitely should NOT use to protect your work. These methods are ineffective, obstructive, annoying and often costly. In every case, they do far more harm than good. So if you’re looking for bad ideas when it comes to protecting your work on the Web, here’s my top of the bunch. 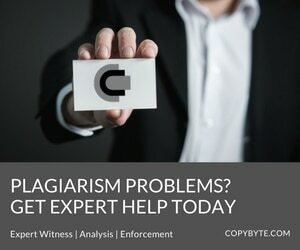 Though it can frustrate human plagiarists, those running software applications will not be thwarted in the least. Regular users, especially bloggers looking to pull quotes, will be at the very least frustrated. This is a completely defeatist strategy if you want people to quote, link to and talk about your content. Not a great way to make a name for yourself and increase your status. In order to reduce the amount of feed scraping, many sites convert their feeds from full to summary. This forces readers to click through to the Web page in order to read the full article. The decision to use truncated feeds vs. full ones is one that has to be made on a case-by-case basis. However, it’s a decision that needs to be based on the role one wants the feed to play in the larger picture, not on the potential for content theft. With more scrapers turning to Technorati and Google Blog Search feeds, truncated feeds are getting more and more useless at stopping scraping. Furthermore, scraping content from templated HTML is not significantly harder, as Dapper proved easily. If a full feed meets your site’s goals, whatever they may be, truncating it just to prevent content theft is shooting yourself in the foot. Most will be better off tracking use of their feed and then following through on infringement that way. In an attempt to both protect works and make them easier to sell, many have started distributing longer works in EBook formats, such as PDF. However, some of the DRM strategies can get downright insane. Preventing copying of the file, even for back up, disallowing printing, text highlighting and even password protecting the entire file are all methods that are available and often used. EBooks should be at least as accessible as print books but the draconian DRM schemes some publishers use make paper and ink look far more appealing. One man spent an estimated $150 in time to print a $9 book and other horror stories are easily found. The bottom line is that if people can not access your book, word will get around and fewer people will buy it. It doesn’t matter how interested people are in your content, if they will not pay if they can’t read it the way that they want and have the right to. Twenty dollars can buy you a lot of things. It can purchase a pair of movie tickets, a good meal out or a lifetime registration for a single work at ICreatedItFirst. Copyright, even in the U.S., takes effect the second a work is fixated into a permanent medium. There is no legal requirement to do anything else. If you want additional legal rights, such as the ability to sue for infringement in a Federal court, you need to register with the U.S. Copyright Office. The “copyright registration” services are basically non-repudiation services. They tend to spring up in the United Kingdom since the lack of a copyright office in that country seems to have left a vacuum. They often offer badges or buttons that are supposed to intimidate potential infringers. However, those buttons carry no additional weight to the traditional copyright symbol. Though there is nothing wrong with non-repudiation services, there are situations that call for it. However, there are far cheaper and better services available than the ones we see advertised. Registered Commons is completely free and Numly offers many more features at a much lower price. These newer services seem to operate mostly on fear and ignorance, two things that are in ample supply. Want to keep your short story, poem or rant out of the hands of plagiarists? Embed it in an image. While this sounds great, it also keeps it out of the hands of search engines, the visually impaired and creates a Web design nightmare. These images are ugly, hard to read and rarely fit with the rest of your site. Worse still, it’s completely ineffective without taking additional precautions. Copying and pasting an image is almost as easy as copying and pasting text. It’s a great way to hide your email address from spammers, but not such a great way to protect your content. Fortunately this method hasn’t gained much traction as of yet. This script has killed more mice than the best mousetraps out there. The script works by simply preventing the user from right clicking on the image or, worse yet, anywhere on the page. Legitimate users, however, use the script for a variety of healthy reasons, including to go forward/back, get further information and open links in new tabs/windows. This can cripple the usefulness of a site and does nothing to actually prevent content theft. Most visitors, myself included, make a concerted effort not to return to any site that disables right click. It’s almost never worth the hassle. Protecting your content is a tricky game. You have to take some steps, but only those that do not punish legitimate users. Far too many people go overboard with protecting their work and wind up crippling their sites. The bottom line is that it is one thing to take reasonable precautions with your content, but if you are this scared about someone taking your work, scared enough to practically disable your site, you need to ask yourself why you are putting it on the Web at all. Previous articleDoes Anti-Copyright Help Big Business?